Governor Charlie Baker, a Republican who has spent years carving a reputation separate from his party and the president, won a decisive reelection victory Tuesday, buoyed by a strong economy, his embrace of comity and bipartisanship, and an opponent whose message — that Massachusetts needs to aim higher — fell flat with an electorate content with Baker’s leadership. Turnout was on track to exceed any recent midterm election, lifted by antipathy for President Trump. But Baker wasn’t punished for being a member of the GOP: Voters in every region of the state gave him a strong mandate for a second term. Even in reliably blue Boston, he doubled his vote total from four years ago. With 82 percent of precincts reporting statewide, Baker and Lieutenant Governor Karyn Polito led Democrat Jay Gonzalez and running mate Quentin Palfrey 67 percent to 33 percent. At a victory party at the Hynes Convention Center, an ebullient Baker spoke directly to his constituents. Gonzalez had attacked Baker as bereft of a broad vision for the Commonwealth and tried to tie him to the national GOP, but those critiques flopped and the contest was never remotely competitive. Baker has consistently held a 70 percent job approval rating since he led the state through near-apocalyptic snowstorms in his first weeks on the job in 2015. Backed by millions of dollars in TV ads trumpeting his bipartisan credentials and recalling his work to stem the opioid crisis, Baker easily rolled over Gonzalez, who struggled to connect with voters and donors. The scene Tuesday night stood in stark contrast to Baker’s narrow victory in 2014, when uncertainty about the outcome stretched well into the following morning before Baker ultimately emerged victorious over Martha Coakley by a mere 40,000 votes. As in almost all political contests across the country, President Trump, who is deeply unpopular in Massachusetts, loomed over the gubernatorial contest. But Baker, who didn’t vote for Trump in 2016 and has criticized his party leader on multiple fronts, managed to craft an identity a world apart from the New York billionaire. While Trump thrives on explosive confrontation and incendiary attacks, Baker, a former state budget chief and health insurance executive, leaned into his reputation as a wonky technocrat. He reveled in being called boring, labored to avoid public conflict with the Democratic-controlled Legislature, and delivered public statements that were odes to pragmatic, bipartisan, and courteous governance. Baker, for example, urged officials of both parties to “commit ourselves to a common decency in our debate, and in our dealings with one another and the public” in a major 2018 speech. Gonzalez, hoping to tether himself to the national anti-Trump movement, nevertheless flogged the incumbent for his promised support of a Republican ticket that included pro-Trump candidates such as Geoff Diehl, the Senate nominee. As voters streamed to the polls Tuesday, Gonzalez’s Twitter account promoted the charge that a “vote for Charlie Baker is a vote for Donald Trump,” and linked to an 11-month-old story about Baker’s fund-raising efforts for national Republicans. The attacks, however, never found a home with Massachusetts voters, many of whom happily quarantined Baker from the Trump-fueled backlash that helped drive turnout that Secretary of State William F. Galvin said late Tuesday could exceed 2.4 million. 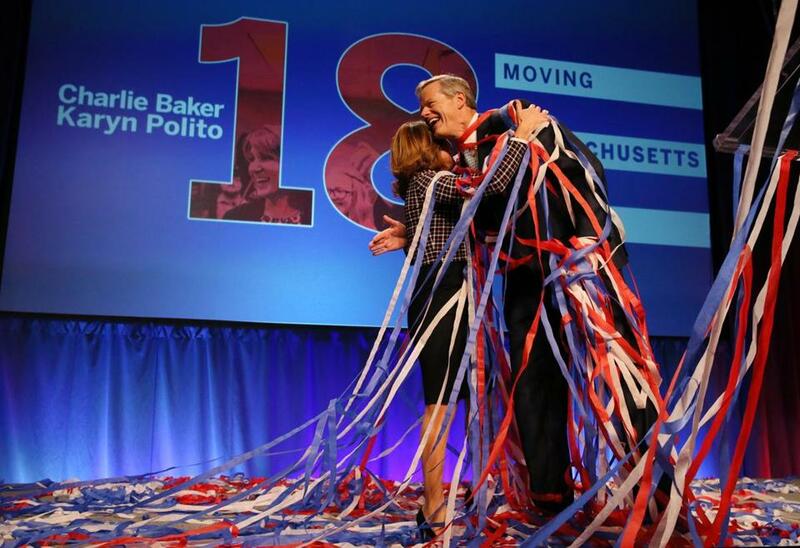 It meant Baker and Polito will remain the red rock in Massachusetts’ lapping blue waves. Democrats declared victory in races for every other constitutional office Tuesday, with Attorney General Maura T. Healey, Galvin, Treasurer Deborah B. Goldberg, and Auditor Suzanne M. Bump all taking reelection. For Baker, few political headwinds formed to buffet his reelection bid. The economy has hummed during his first term, the state’s public schools have kept their lofty rankings among the country’s best, and Baker did not stand in the way of several major initiatives, such as a new paid family leave program, even as they rubbed up against his past-campaign pledge of no new taxes and fees. He also avoided sharing the ballot with a hotly debated measure that would have asked voters to create a surtax on the state’s wealthiest residents. It was felled by a legal challenge months before Baker seriously campaigned for reelection, or took a public stance on it. The court decision also robbed Gonzalez of a potentially potent political prod in what became a key tenet of his campaign pitch: Those who have more should pay more. Governor Charlie Baker and Lieutenant Governor Karyn Polito celebrated the victory. Gonzalez proposed taxing the endowments of wealthy colleges to the tune of $1 billion a year and pursuing an additional $2 billion in revenue through the extra levy on the state’s millionaires. That, he said, would pay for a number of promises that lacked details, including delivering more affordable child care and moving the state to a single-payer health care system. But a Gonzalez upset was always improbable. An obscure political newcomer when he launched his campaign 21 months ago, he struggled to generate the money needed to challenge Baker. Baker has said, if reelected, he wants to focus on building more housing in Massachusetts, lamenting how many middle-class families are being crowded out of once-affordable neighborhoods. And he’s said tackling climate change at the state level would be a major focus. This week, he also said he would serve a full four-year term if reelected, no small question given that recent GOP governors either decamped the corner office to seek US ambassadorships or turned toward presidential aspirations.